S’mores are an absolute bonfire necessity. If you build a fire and you don’t make s’mores—well, what are you doing with your life?! (Just kidding—you don’t have to be as crazy about s’mores as we are.) Graham crackers, chocolate and toasted marshmallows are an absolute classic. For our back yard bonfire we attempted to take this classic treat and fancy it up a bit! We made sure to have a variety of chocolates available: dark, milk and cookies n’ cream bars. We also had fresh fruit for adding into your s’more sandwich, or enjoying on its own. We pre-coated some graham crackers with different flavor combinations. We had (from left to right): mint chocolate chip, strawberries and cream, dark chocolate with sea salt, and coconut cream. You can add flavor extracts to melted white chocolate to create so many different flavors. Keep in mind that extracts (and most food dyes) will cause melted chocolate to harder faster; so you may need to spread your chocolate onto your grahams quickly if you choose make some of these combinations. All photos by: Janae Hardy. Cutest. Most brilliant smores ideas. Ever. This is probably one of my favorite posts you’ve ever done! Here in the Netherlands you are not allowed to have a bonfire in the backgyard unless you are very rich and can afford house somewhere in the middle of nowhere…. But I can still try your specialities on a BBQ, can’t I? those look so delicious! what a great idea! I would have never thought of it! Oh my dears, you forgot nutella! Best smores ever. Everything here looks absolutely heavenly. 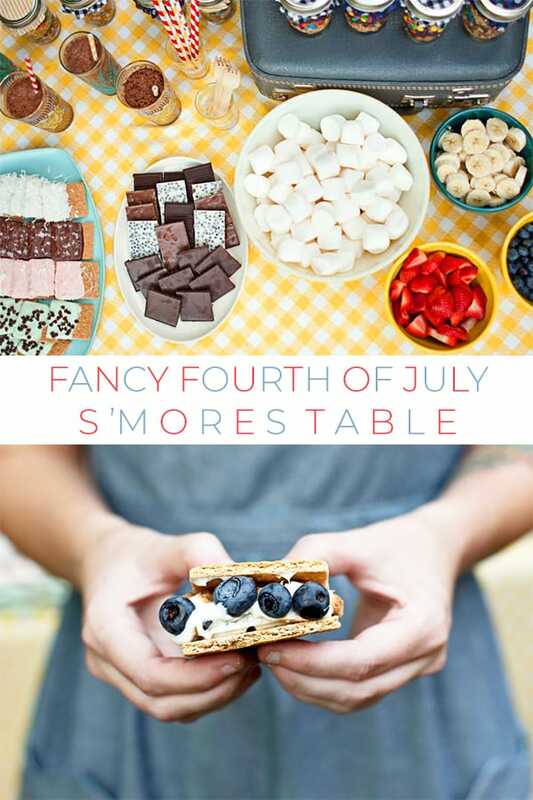 Mmmm…those are some fancy smanshy smores and now I’m soooo hungry! Great ideas! Backyard bonfire are the best and you guys are so clever! those s’more are insane!!!! loveeee. This is way too cute! Love that they’re precoated with different flavors, and then having yummy fruits? Ahhh so much fun! What a wonderful idea! I cannot wait till my fiance and I finish building our house so we can invite friends over for s’more party! So cute! Smores are such a great summer treat!! Those pre-coated graham crackers are such a cute idea! And they add a touch of class and flavor to the typical s’mores. This is such a cute post! Wow some really scrummy yummy ideas there. Must try! WHY I HAVE I NEVER THOUGHT TO FANCY-FY S’MORES?!?! BRILLIANT! And lovely. delicious fun! fantastic new flavor ideas & combinations. i want to make them right now. Looks delicious. The coconut ones just look so yummy! I love this idea! Mostly because I really don’t like marshmallows. (I know, what exactly is my issue? LOL!) I’m all for all the other fantastic options. those look like no smores i’ve ever had… and that’s what makes them awesome! You are such a constant inspiration and I love your blog. We are redoing our backyard (with backhoe and all) and these will be ideal little treats for when we are “open for business” again! This is perfection. I love bonefire season! Oops, I think I just drooled on my keyboard! Yum! Yuuuuuuuuuuuuuuuuum! Who doesn’t like a s’more? Ohhhh, those look so darn tasty. Mmm looks so good! I’ve never tasted smores in my life. That goes directly to my imaginary list of things I need to try! o this is fantastic! my fiance would die if he saw this ! I love the pretty pre-coated graham crackers!!! These look so delicious, and it’s made me want to have a bonfire party! I’d do anything to be there right now! Especially this one with the Marshmallows. Maybe you will like a recipe from my blog. That’s a tradition that I would love to import to Europe!!!! I love bonfires they are always so much fun, ans smores who doesn’t love them!! I’m from the UK and I’ve never had a s’more but these look amazing! I’m a marshmallow and chocolate fiend so I bet I’d love them. Such a cute idea! These look absolutely delicious! I wonder how you heat them though? Do you put them in the fire somehow? ooh! Yum! AND, I’d love to see more photos of whatever those cute decorations are along the fence! Beautiful pictures.. Hampton is quite worried about his waistline though.. nevermind, great food! yumm! that looks so good! Makes me want to go camping. i love it. my daughter is having a “camp themed party” so fun ideas here! id love to see more of that fringe thing hanging on the fence. looks cute! Mmmmmmh, delicious. I’m hungry now. What a great idea! I would’ve never thought of those combos. You ladies are smart. These all look delicious! What great ideas! My super-healthy fiancé is very sweet-averse, but smores are his one weakness! These would be a perfect birthday/anniversary treat for him. I love s’mores! and these look amazing! This looks so delicious! I’m so hungry now. This is heavenly! I want to come to that party like..right now. awesome idea, i can’t wait for summer days filled with evening bonfires! This looks amazing (as about 100 other people have said). We love entertaining in our backyard every summer. My husband is a high school teacher, so he loves to invite people over to BBQ. This is absolutely on my list of treats. Can’t wait for the good weather and the backyard parties! Omg those smores look delicious! What a delicious post! Love it! oh my word! how fun! that’s such a great idea! Those lawn chairs are the cutest. What are the chances on a tutorial for covering those? these look so yummy! thanks for the idea! I highly recommend adding peanut butter to your s’mores! It’s life changing. PS – for those who don’t have a BBQ pit, you can make them in the microwave. Mmmm that looks so good.. I never get invited to parties like these.. I guess the solution is throwing them myself. All i can say is ‘Droooooooooooool’ that looks so yummy! Mmm… This looks just… wow! Mmm s’mores! Love the idea of putting them on skewers. Thankfully I live in Southern California and dont’ always have to wait until summertime (or snow to thaw) for s’mores! That IS fancy! Love the crackers! To Csilla from Hungary: S’mores are so named because they taste so good you want some more!! What a cute + fun idea! I looove having bonfires at my house but what I love even more is making (EATING!) s’mores 😀 Love this idea, def want to ‘glam up’ my next bonfire! You make an ordinary cookout look so extraordinary! Love the detail you put into everything. try them with Reeses cups in place of Hershey bars. Mmmm! So creative! You know how to turn simple things into treasures! ok so that’s where you were. what a great tradition. love this net. kate would love that net. you and katie poops have fun this wneeked. love that yall are doing this! ok. confession. i didn’t read the text of your post lol. my eye went saritght to the awesome photos. and then I read your post after I commented. quite backwards, huh. Anyway, a fan of Gabe’s work already and LOVE you and Bob’s images!!!!!!!! – oooooh horaoy! camping is always a blast. we went camping at the same location a couple years back for the fourth and we had thee worst time, mostly due to the absurdly hot weather. Glad to hear you got a nice break from civilization!